If you are looking for your own private ocean front beach cottage on Olde Cape Cod, stop, you found it ! An absolutely perfect choice for a well deserved vacation. One of seven homes built on this former island location, this is the first time offer for leasing this private single family 3 BR home on Mill Creek just off Lewis Bay..
It’s superb location offers easy access to Hyannis Main St, the Mall, medical/hospital, shopping, restaurants, transportation, while enjoying this convenient sea front location that has amazing views of the sparking sea, boating, sail boarding with lots of natural wildlife activity. It’s a short paddle to Mill Pond, one of nature’s best Kayaking and Canoeing areas on the Cape. Bring your friends and family to this delightfully charming New England paradise. The beauty of Prince II is it’s captivating and ever changing waterfront and wildlife vistas. With a 100’ long beach front location, Prince II provides the safe water access for children and adults, allowing for wading or swimming into and across the waterway. 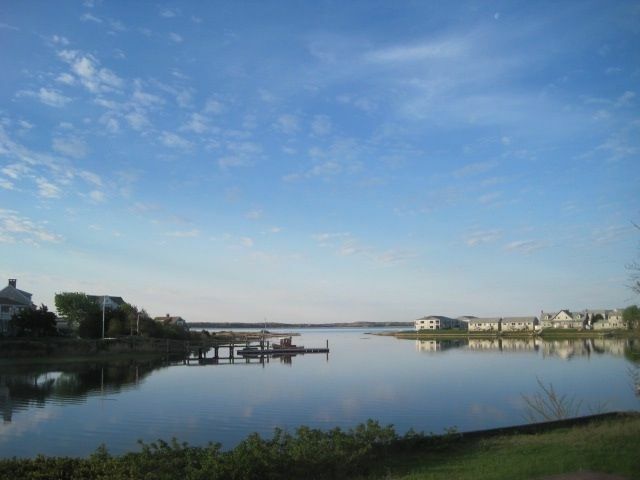 The waterfront location allows boating access to Lewis Bay, Nantucket Sound and beyond. Hyannis Harbor is around the corner and minutes from the site. The sounds of the birds and wildlife and the rusting of trees responding to the cooling ocean breezes lets you know that you are in one of the best locations you could ever wish for. On a typical day one can see cormorants, diving osprey and kingfishers, majestic blue herons, occasional white swans and numerous ducks. The existing 4 BR – 3 Bath home of approx. 2,400 sq.ft. has many attractive appointments including natural oak pegged hardwood floors, brick fireplace, ceiling fans in every room, white vertical paneling, accent wainscoting, Corian kitchen, washer and dryer, tiled baths and with a long covered ocean side porch for outdoor lounging. The upper level of the home offers a King size bed in the master bedroom with private bath and another bathroom for the other two bedrooms which have twin beds. A new foldaway bed is also available. The lower level has direct walk-out access via another brick patio to the oceanfront beach. It is designed with an open plan Living-Dining with large screen TV, Guest Bedroom with twin beds, Open Kitchen-Bar and full bath with Shower and Laundry Area. The home is a perfect choice for family members to have an enjoyable oceanfront gathering. The Upper Level: offers one level living with 3 Bedrooms and 2 Baths,Living Rm. with fireplace and large screen TV, Dining and newly updated Kitchen. The open plan is casual and informal with comfortable furnishings. This level has a brick patio, Bar-B-Q grills (Gas & Charcoal), a very large well landscaped rear yard that is continuous to the seawall with a few steps down to the beach and water access. The Lower Level: has an open plan with additional Living Room with large screen TV, Kitchen-Bar, Full Bath, 4th. Guest Bedroom and Laundry Rm. This space is great for separate guest or family members with direct access to another brick patio and the ocean beach. Both levels have numerous outdoor chaise lounges and chairs for your pleasure as well as access to two Kayaks. Private 100'+ waterfront 'kid friendly' shoreline beach along entire rear of house property. Long paved Driveway for at least three cars + 2 added spaced in a graveled area. Full time Comcast Internet Modem and Router for full WiFi service. Open space with slider to rear porch and water views, Masonry fireplace, two sofas and two ceiling fans. Living Rm. has 42" HD Wide Screen T.V. 2 working adult bikes + 2 children bikes and scooters Toddler wagon and car. Home has a finished walk-out lower level with an open plan containing a Kitchen-Bar Area, Laundry Rm. full Bathroom, open plan Living Rm. with large screen TV, Blue-Ray Player, a guest Bedroom and direct access to lower level brick patio and Ocean front beach area. Two owner provided kayaks, life pres. and paddles. this is a wonderful property and we had a lovely 8 day stay. The Zorzi's live at the home next door, so communication is easy. The home is beautifully appointed, well maintained, the yard has a lovely patio with gas BBQ, a level grassy area on which we hosted a clambake for 30 people, and the steps down to the lower level lead right to the water's edge. Two kayaks are available for use. Inside, the kitchen is excellent, the table capacious for all of us to eat, the living room comfortable for all to sit and enjoy company, the bedrooms comfortable and the bathrooms lovely. It is a short walk to the beach along the Nantucket Sound from the house which we did each day with our two year old granddaughter. My wife and I would readily come back to this property. It was a pleasure having this multi-generation family as guest. Although they did have a clambake for 30 people, you would never know it. The home and site were left in a very clean, well maintained condition. We do appreciate hearing from our guest since it helps us to address or add more amenities in the future. One significant addition for next year will be a new boat dock and pier which should afford a nice environment for swimming, fishing and boating. PS: We really enjoyed the bottles of wine you left for us and a one of the reds has been added to our favorites list. This home is in a great location, the view is fantastic - we couldn’t get enough of watching the wild life and sail boats. The kayaks were a lot of fun too. The house itself is good size, clean and comfortable. We had four adults and four children and all fit nicely. The lower level is renovated into a small living space with a bathroom. It is not as nice as the main floor but suited us well for sleeping and showering. The floors are creaky and sound travels very easily from upstairs. Thank goodness the kids were exhausted from such fun filled days! The owners live next door and we’re very welcoming. The beach is a short walk down the road, some days we opted to just hang by the water at the house and play - the kids loved it! Loved the grassy back yard with the fantastic view. Wonderful to be in reach of the ocean bay, but a little protected. Great to have kayaks and a little back yard beach to launch them as well as bikes and any number of toys. The house was lovely - spacious and well decorated. We were completely happy with everything about our stay - including 6 days with sun despite a forecast of 7 days of rain. Debra's family were fantastic guest, so joyful. I told them that I wish I had a dollar for every day the weather report said rain, but instead the weather was clear & sunny. So they gave me $2/day for each of the sunny days. We had such a great vacation week staying at your beautiful home! The house was perfectly clean and beautifully decorated, so roomy and homey and great for many people to stay. There wasn't one thing we could think of that wasn't at the house that we needed down to floats for the kids! It was great to chat with you Peter and we did get one of those weed burners and love it! We'll definitely be back! We take joy in hearing about your stay with us. Its so nice to see your family enjoying the home and water. I walked through the house after you left and was thinking 'why do I even need a cleaning crew' ?. it was so nice of you to take the time to pick up the house and do some wash before you left. It was appreciated. Next year we plan to have a boat dock too ! My husband said it best, "This is Paradise." When we arrived and met Madeline and she took us to see the property we knew this vacation would be memorable. The home was beautifully decorated,spotless,spacious with the most amazing views and with all the amenities we needed and more. When our children and grandkids arrived they fell in love at first sight. So much to do without leaving the property. Swimming ,Kayaking and just relaxing on the back lawn. Couldn't have asked for a more enjoyable vacation with our family. So many wonderful memories to treasure. It gives us great pleasure to hear that your family enjoyed staying at our waterfront home. We can identify with three generations enjoying a wonderful Cape Cod vacation. We thank you for leaving our home in such good condition, please do come back as see us again. Our family of eight (grandparents, parents, and grandchildren ages 15 and 11), stayed at this house for one week and enjoyed every minute. The house is well equipped with everything you need, including beach towels, bicycles, kayaks, BBQ grills, plates, glasses, and cooking utensils. We ate most of our meals at home and outside, and used the kayaks every day. The living and dining areas of the house are large and spacious with comfy chairs and couches and two very large TVs. The waterfront backyard has at least six chaise lounges with cushions and a dining table that easily accommodates 8 adults. There is a selection of children's games and videos to keep younger children entertained. Our 11 year old loved the kayaks. I would recommend this property to anyone wishing to stay on the Cape, you will not be disappointed. Fishing, Kayaking, Swimming etc. out of the back door, Landscaped Lawn, Private Beach, Clamming, Christmas Tree shops, Easy access to Ferry for Nantucket and the Vineyard visiting. Owner provides two kayaks and life preservers for guest use. Security Deposit of $500 due upon arrival. Must be Bank Check or Cash. Credit Card Payments can be requested using 'Paypal' No refunds on any deposits unless the home is re-rented for the same time period and rate.